How underrated are cacti in Minecraft? Cactuses can be used for so many wonderful things, so why not have a great way to farm them? Cactus is known for its use in making "cactus green," which is a colored dye that can aid in making cyan wool, lime green wool, and green wool. 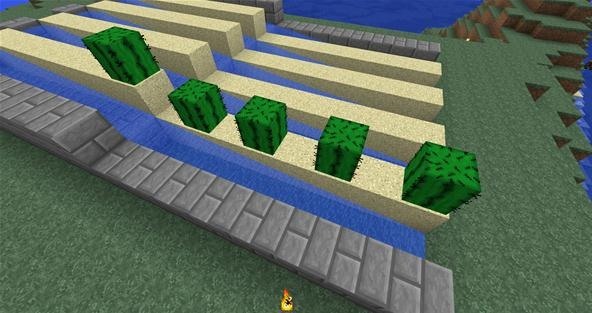 Cacti can also be a great defense mechanism against mobs and other players and can help make death traps even more lethal. 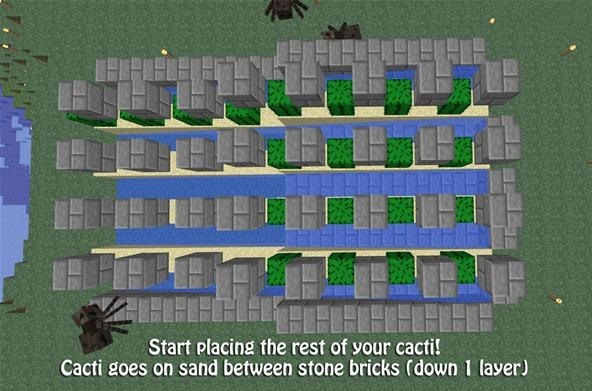 This tutorial will show you how to make a quick, easy and customizable cactus farm. Feel free to watch the video to follow along as you build, or continue below for the step-by-step written directions. You will begin the "layout" process for the first step. 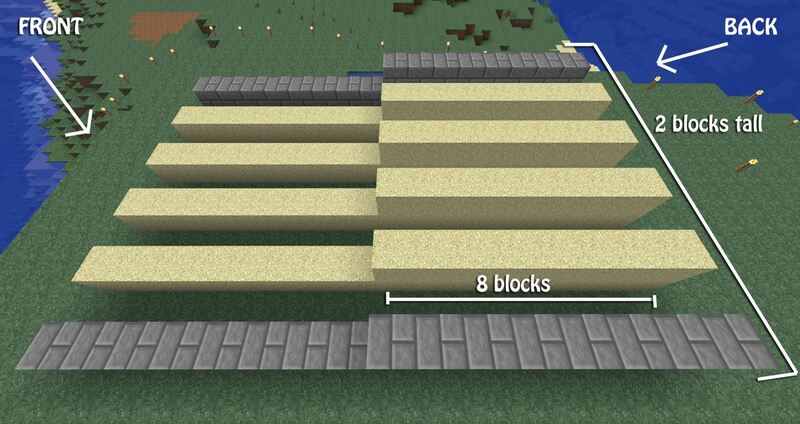 Place four sand blocks horizontally so that they're one block away from each other on the ground. 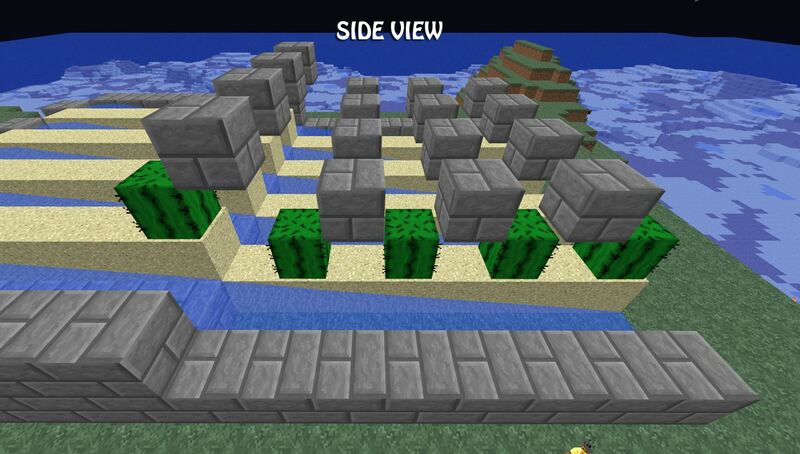 Keep in mind that you will need to use sand for your main material, as cacti can only be placed on sand blocks. 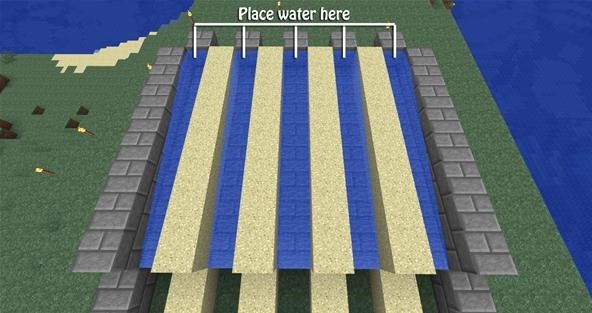 To the left and right of the sand blocks, one block away, place your building material. 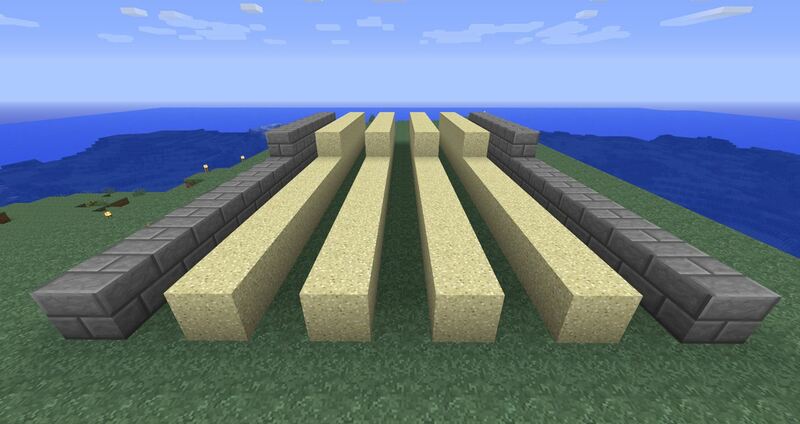 I chose stone bricks as my building material, but feel free to use glass or anything else you prefer. 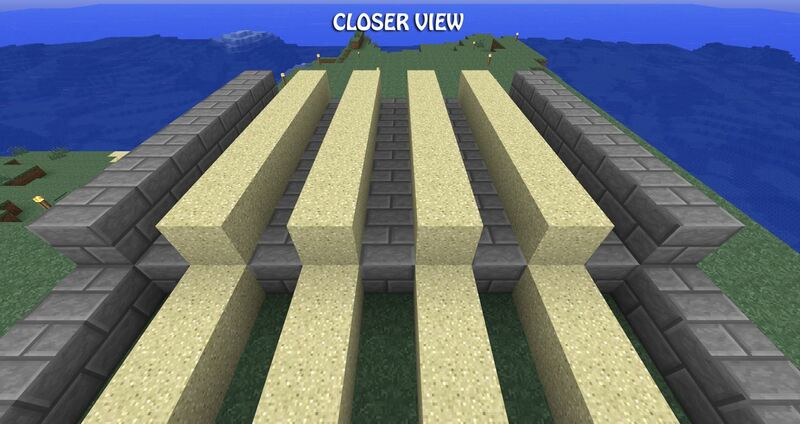 Continue building your layout backwards, as the first blocks you placed will be the front of your cactus farm. Build each line out so that they are 8 blocks long. Now that you've decided which end is going to be the front of your farm, you're ready to continue building off the back. 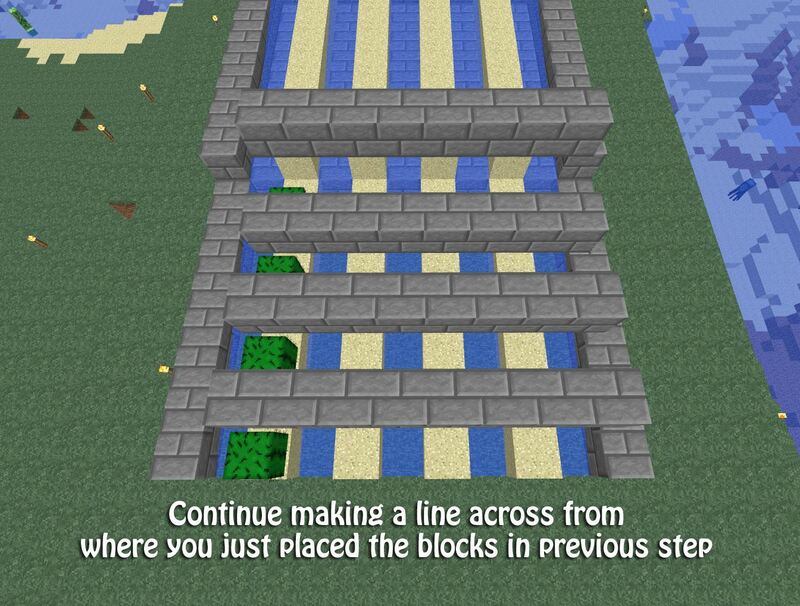 Just do the exact same thing you did in the previous step, but make every line two blocks high instead of one. Because we're adding this second half of the farm, this will net you about 32 extra cacti, bringing the grand total to 64 (one stack) cacti. Because we raised the back half up one block (when compared to the front), we will need to raise the ground on which the water will be placed. 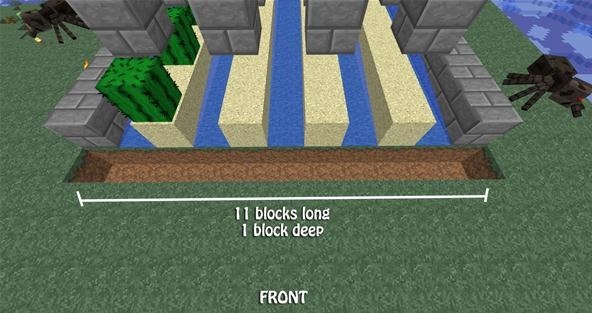 You will need to place 8 blocks (any material) on the ground in-between each two-tall wall to get ready for water placement. 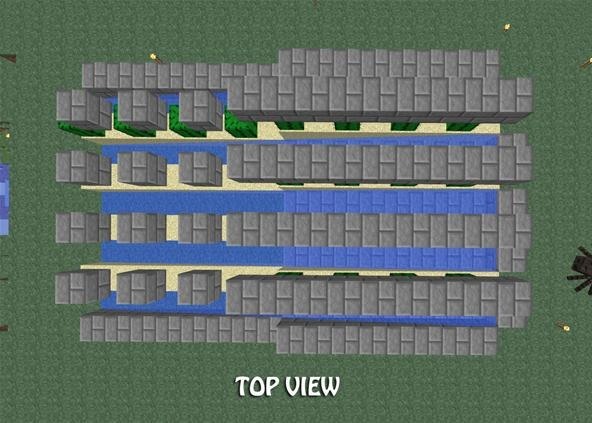 Create a back wall so that the water does not get out of control. 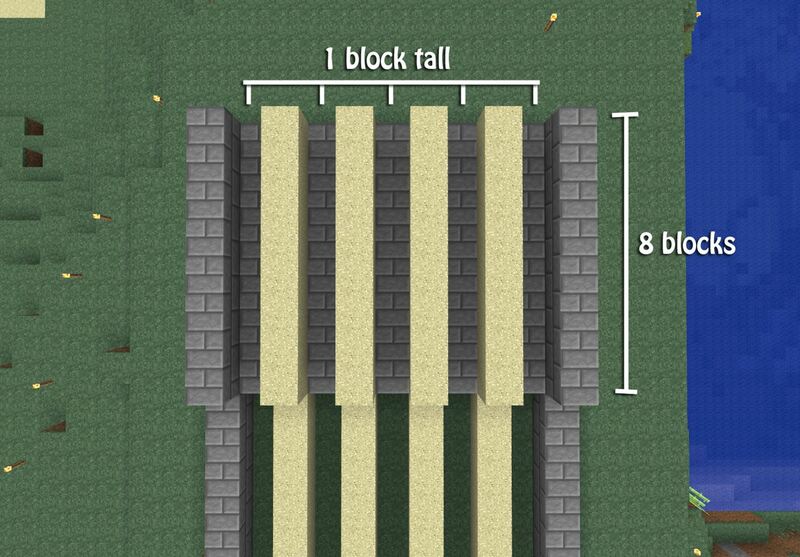 This back wall should be two blocks tall. The wall will prevent the water in the next step from flowing out the back end of the farm. On the back top layer, place water at the furthest point in all 5 trenches. Do the same thing for both layers, top and bottom. 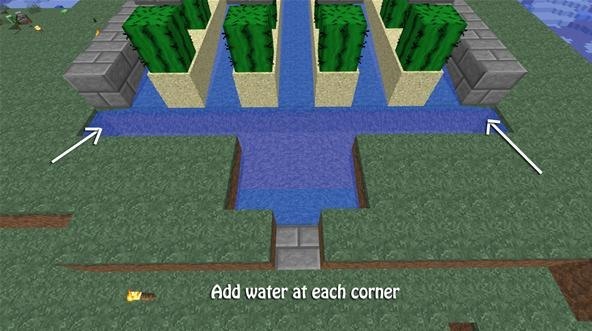 Notice that the water stops exactly at the front of the farm without making a mess. Now, start adding some cacti to get a feel for where your "ceiling" will go. This ceiling will do all of the work for us, so it's important to follow this step very closely. Place cacti in the same pattern I did below. 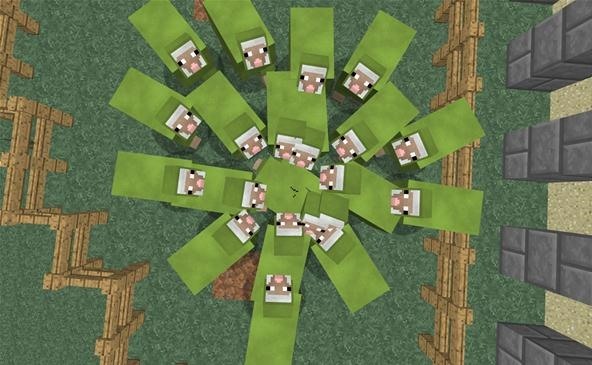 Starting from the front of the farm, place a cactus, and place another cactus every other block behind that. You will end up with 4 cacti on each sand line, per level. Go back to the front of your farm, and place your building material on top of the front cactus. Place a second block directly behind that (going towards the back of the farm). 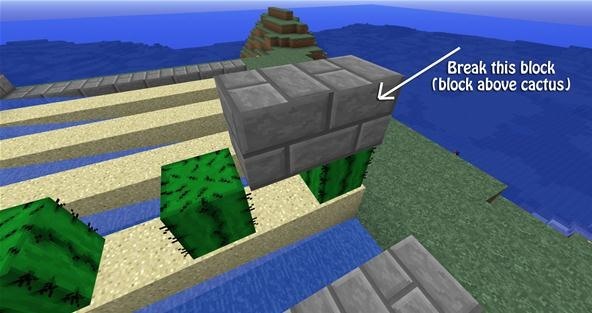 You will now need to break the block that is directly above the front cactus. Continue building a line across the top of the cacti. 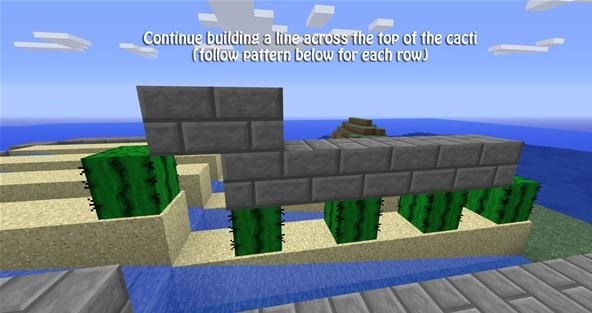 Once you reach the last cactus in the row, place two blocks on top of it. 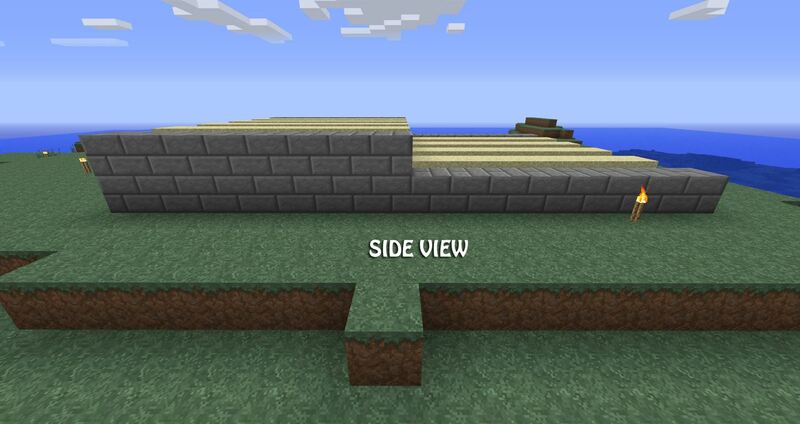 Next, place a block directly behind it (building towards the back of the farm). 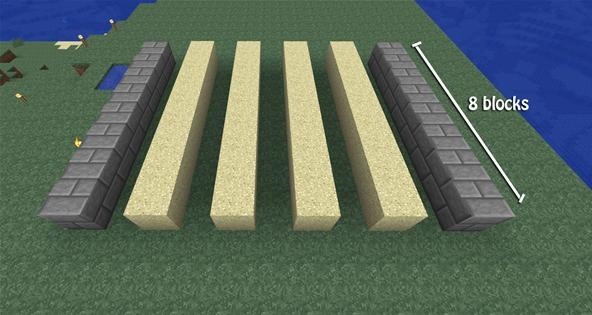 You will now break every other block in the line you just created. 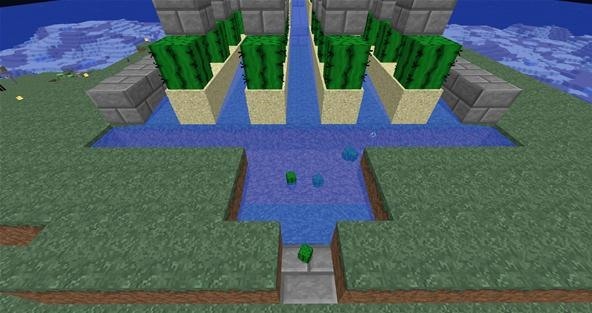 Use the cacti as your guide, and only break the blocks directly above the cacti. You should end up with an exact replica of the design in the image below! 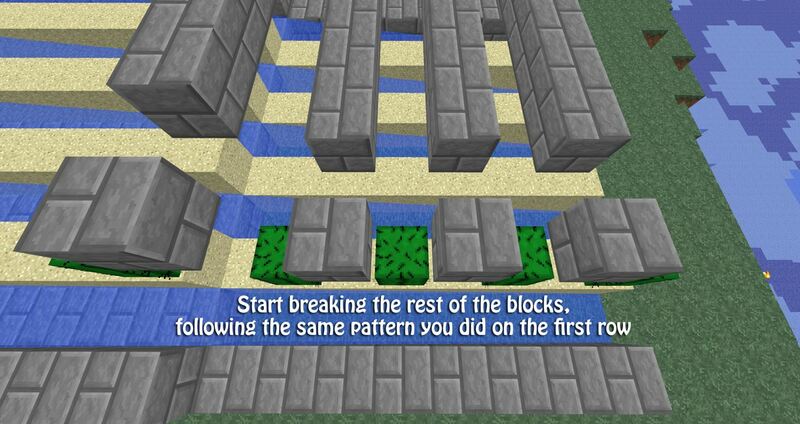 Build off the pattern you just created in the previous step. Make solid lines all the way to the opposite end of the first layer. Continue breaking the rest of the blocks from the solid lines. If it helps to place cacti, do that now before attempting to break the solid lines you just created! 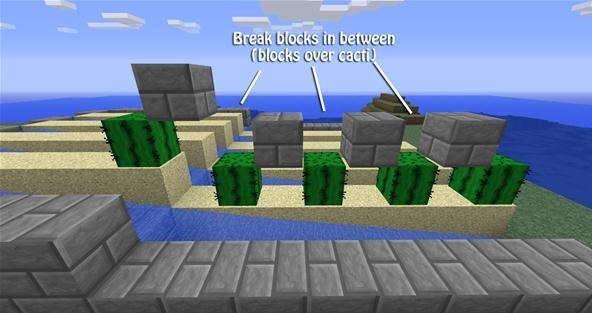 Remember - You will only be breaking the blocks that would be directly on top of the cacti. 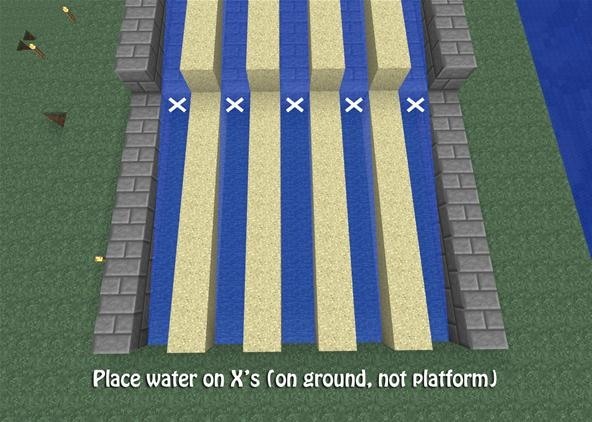 Any blocks over water in this step should be broken! Use images below for reference if you're stuck. Building off of the beginning top layer we already made, create solid blocks like you did for the bottom layer. This time, our lines will be going a different way, but don't let it fool you! It's even easier this way if you place your cacti first. 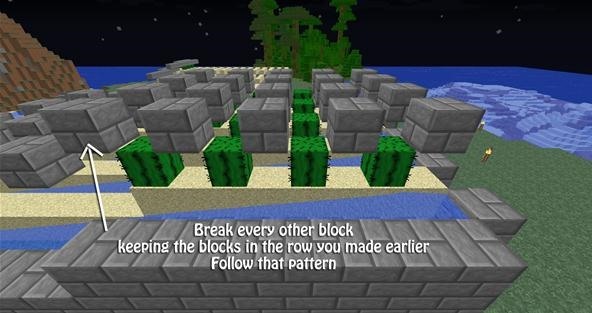 Break every block that is directly above the cacti. Start placing the rest of your cacti, if you haven't already. 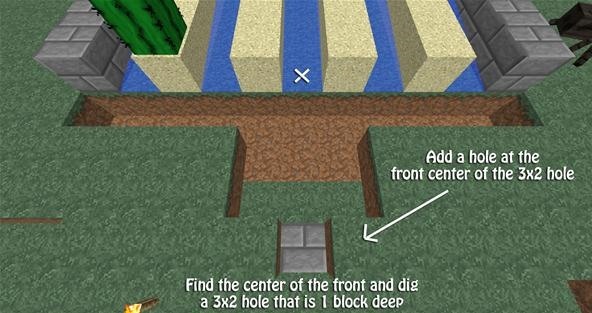 At the front of your farm, dig out an 11 block long hole that is only 1 block deep. This hole should extend the entire width of your farm. Find the center of your trench and dig a 3 by 2 hole that is one block deep. Add a hole at the front center of the 3 by 2 hole and change the bottom to a material of your choice. This hole (stone brick as shown in my picture) is where all of your cacti will gather once they grow. It makes the gathering process quick so you don't waste any time! 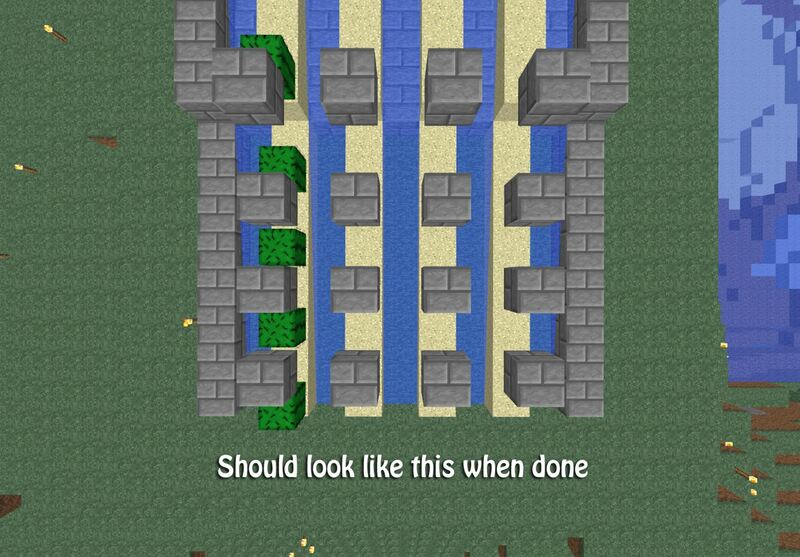 Add water at each corner (left and right) in the trench you just dug out. See image for reference! Wait for your cacti to grow, then collect your loot! Now, make some cactus green and dye the pants off of some sheep! Cacti can grow in the dark (no light needed)! 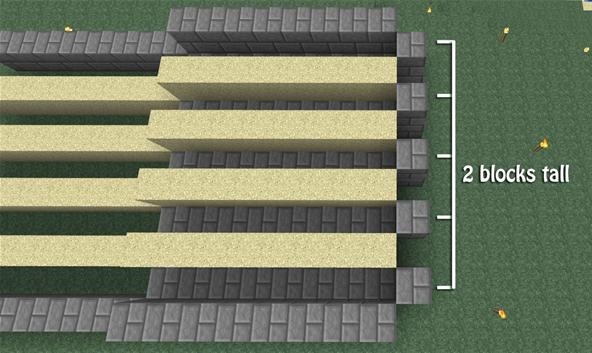 You do not need to be within 7 chunks (120 blocks) of your cacti farm in order for it to grow like you do with sugar cane, wheat, etc. The bottom of a cactus will not hurt you! Throwing items into a cactus will make the items disappear (useful for a disposal). What do you plan on doing with your cacti when you're done? How do you dye sheep? For a color like green, you cook the cactus that turns it into a dye. For lime green you need to use the green dye and craft it with bone meal. Other dyes can be created from roses, daisies, ink sacks, lapis, and bone meal. Coco beans can be found in chests in Abandoned mineshafts and it makes brown dye. Just hold any dye and right click it on a sheep. This will dye the sheep permanently and it will produce the dyed color from then on out. I like to get some red dye, sugar, bread, and (If I can sponge. TMI mod) cacti dye. Then I put them in a dispeser and call it my sandwich making box. Make sure that the 4 sides are all open spaces! Make sure that it is also on sand. Cacti need 4 open spaces on all sides. like a plus with sand in the middle.Fun fact about cacti. You can also use them as an item destroyer. If you throw something on a cactus it will take damage and disappear. How can i spawn cactus in my world? I'm playing on the Xbox 360 version and i explored my whole map and haven't found a single one. I also don't want to start a new world because i love the one i'm currently in. Which is a shame, because with even one single cactus, you can grow as many others as you want. You are. 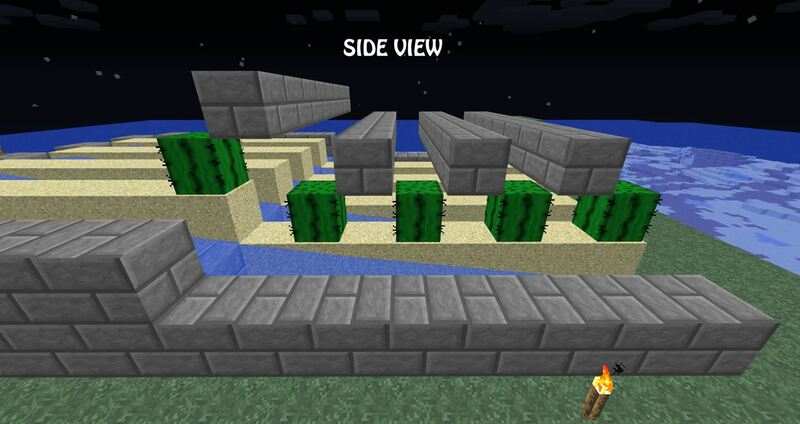 Cacti do very much exist on the Xbox version. Oh ok. I dont remember seeing them for some reason.